Ahhh, this night I really enjoyed myself! Imagine a unlikely place of beauty, the St. Croix lake, with the emerald waters of the “gorges du Verdon” and just above a sky of dream. Between the two: the Olivier Planchon Observatory located near the nice small village of Bauduen. In the observatory a heavy reflector holding a main mirror of 24″ (620mm) f/d 3.3, a series of brand new Ethos eyepieces and voila. My pencils show the target of the moment: another comet PanSTARRS, still quite small, but just near the comet a very pretty double star. – It is also called STF1758, a Struve of 1830. The separation was 3.4” in 2010. It is more than likely a physical double because Hipparcos gives the same parallax for A and B, so a distance of 279 light year. The couple turns slowly, 15° in almost 2 centuries. 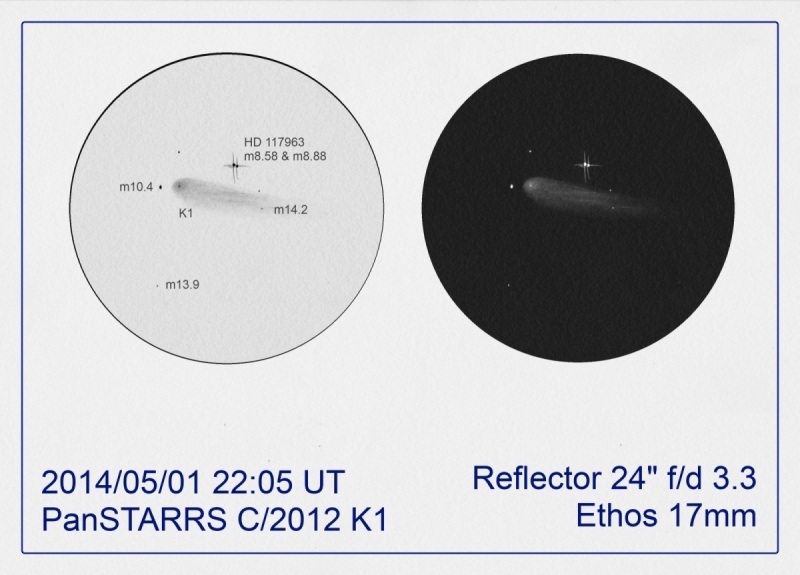 This is undoubtedly the superb material and this nice double, that I was deprived of the sight of the ion tail, I will return in this observatory, that’s more than sure! I wish all the best to the ASOD community ! 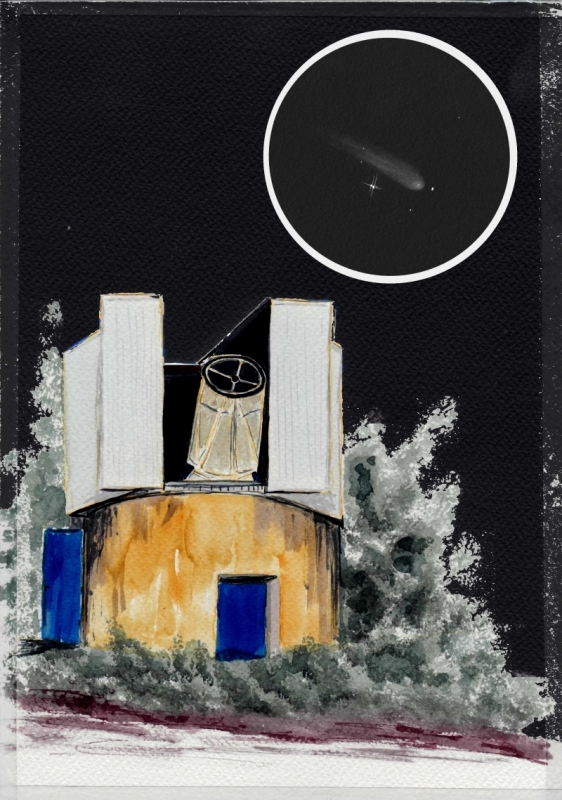 That is a very fine watercolor of the 24″ observatory. The comet and double star make for a great combination of near and far targets. I must say I was quite envious of your night with a 24″ scope. I very much enjoyed your depiction & description of the telescope. The double stars shine in your sketch and it must have been a lovely sight as you depicted it here. Thank you for sharing it. Very nice combination of the observatory with comet picture. Good idea to distinguish the drawing field from the observed field. Easier for scaling. Our brain is able to zoom on details impossible to reproduce with a pencil at same scale. We need to artificially enlarge the subject, mostly for planets. I will use this trick for my next sketches. Good image, fine drawing. Bravo Michel !!! Ho thank you Jean-Marc, I’m proud to inspire artist like you !